vote in favour of Pakistan. issue would be solved soon. Commander Burhan Muzffar Wani by Indian troops. The moot was organized under the aegis of Muttahida Tulba Mahaz for Kashmir Freedom Movement. the Kashmir cause, he added. He said the United Nations had passed almost two dozen resolutions on the Kashmir cause. Not a single country had voted against any resolution which proved that Kashmiris were fighting for a just cause. resolutions, had no right to remain member of the world body. realities in Indian Held Kashmir,” Raja Zafar said. He said after July 8, 2016, the Kashmir movement entered into a new phase. A number of Kshmiris had lost their lives since then as the Indian occupation forces were continuing atrocities. In fact the authorities wanted to convert Muslim majority of Kashmir into minority and India’s that attempt should be countered strategically. 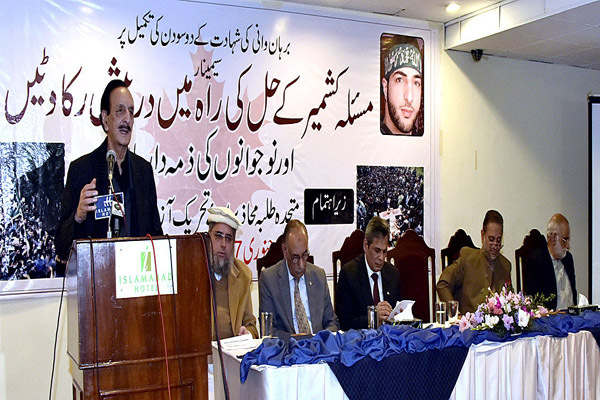 Former Azad Jammu and Kashmir Prime Minister Sardar Attique Ahmed Khan paid tribute to the Kashmiri youth, who were rendering matchless sacrifices during their struggle for freedom. He urged the Kashmiris to keep their morale high and did not get disappointed due to the brutalities of Indian force as they would attain their objective soon. barbarism of India in the occupied territory. The resolution also demanded of the United Nations, Organization of Islamic Cooperation, Amnesty International and other human rights organizations to put pressure on India to release all illegally detained political leaders, repeal draconian laws, withdraw its forces from Kashmir and lift curbs on movement of the resistance leaders. Shoaib and Hurriyat leader Abdul Hameed Lone.